A resiliency framework for planning in state transportation agencies - Download this document for free, or read online. Document in PDF available to download. 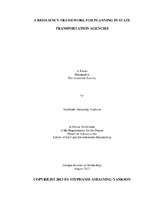 This thesis presents a framework for resiliency planning in state departments of transportation and other transportation agencies. The development of this framework is motivated by the need for more resilient transportation systems, due of the increasing frequency and the effect both natural and man-made catastrophic disasters have on transportation systems. The resiliency framework is based on the urban transportation planning framework and is thus applied in the broader context of general transportation planning. The resiliency framework is then applied in a preliminary review to three statewide transportation plans to show the resiliency deficiencies of those plans and how the framework may be applied to increase resiliency. These plans are selected from three different states with diversity of locations and without any preconceived notions about their incorporation of resiliency in their planning process. This preliminary review reveals a reactive nature towards investments that increase an agency’s resilience. This may be attributed to the problem of limited funding for transportation investments, as well as, limited knowledge by the transportation agencies about the return on such resiliency investments, mostly due to the uncertainty associated with the occurrence of catastrophic disasters, especially the predictability of weather-related events. However, post-disaster transportation system overhauls provide enough evidence for the need for more systemic ways of addressing resiliency in planning processes.